Seoul is quickly becoming a leading design city. As the World Design Capital 2010, Seoul is organizing various activities to improve its standing among the top 10 design cities of the world. Seoul Metropolitan City awards annual prizes for beautiful buildings. The winners are selected based on artistic value, technology and contribution to the public. In this fast-changing city, there are unique buildings with enduring value that are well worth visiting. Boutique Monaco, the winner of the Seoul Architecture Award 2009 prize in housing, is located across Samsung Town in Seocho-dong. Viewing it from a distance, it looks like an apple from which somebody has taken a couple of bites. It is a unique shape, a building with cube-shaped empty spaces here and there in the center and on the outer walls. It was originally approved to provide housing, but was designed to be multipurpose with a housing function. The architect of this building, Jo Min-seok, came up with the idea to make spaces in the building structure in order to comply with regulations regarding floor-area ratio, while keeping the planned 27-story height of the building. Thanks to this idea, the building became known for its interesting shape. The judges of the Seoul Architecture Award commented, “Boutique Monaco satisfied the functional requirements with creative shape and space structure.” Commercial spaces are located on the first four floors with the floors above used for housing. These two types of space are distinguished with different exterior designs. There is a gallery on B1 floor, adding a relaxing atmosphere. 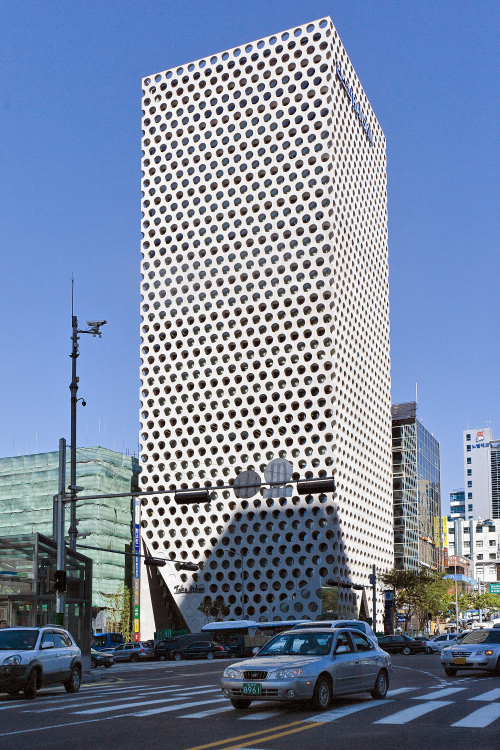 Urban Hive, the winner of the grand Seoul Architecture Award 2009, draws the attention of pedestrians with holey design. With 105cm-diameter holes on the white concrete walls, the building looks like a hive. The building exposes its concrete structure, exposing the many holes inside which resemble a sponge. Prof. Kim In-chul, the architect of Urban Hive, has maintained the principle that buildings are for human beings. He tried to visualize that principle while designing the building. By making holes in the wall, it is possible to provide to the tenant of the building an appropriate amount of sunlight and a restrained view toward the outside world. Looking at the building, there are many aspects created for people. There is a rooftop garden with grass and trees. The color of the building is not grey concrete, but white, which gives it a refreshing look. On the first floor, there are spaces provided to pedestrians where they can sit and rest for a while. Through the consideration of the architect, the building also gives a great night view to those who live in this dry urban area. Thanks to him, everyone passing the Kyobo Tower Sageori in Nonhyeon-dong can see a piece of lit-up swiss cheese in the evening. Kring is a creative culture space offering events including performances, exhibitions, movies and digital art. It aims to become a representative cultural attraction in Seoul. There are also lifestyle spaces such as a cafe and a sky garden to provide a relaxing environment. 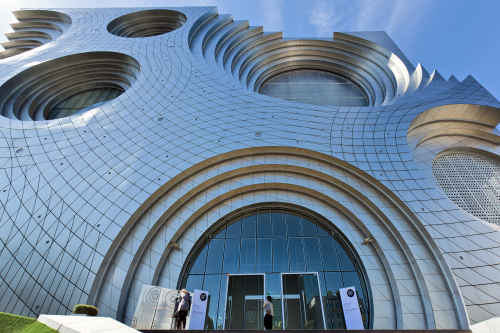 Kring, in COEX, Samsung-dong, was designed by architect Jang Yun-gyu, President of UNSANGDONG Architects Cooperation. Using circles as its design concept, it is quite spectacular. Kring is the Dutch word for circle, and circles can be found all over, both inside and outside. Kring exists within a square frame, but there are many “rings” floating like bubbles in the frame. Circles on the outside wall of the building seem to be absorbed into the inside and float around in the open space like ripples on the surface of a lake. The inside space of Kring is wide, with many open areas. This open space gives the impression of freedom, just like starting to paint on a blank page. The space can be easily divided when an event is held inside the building. 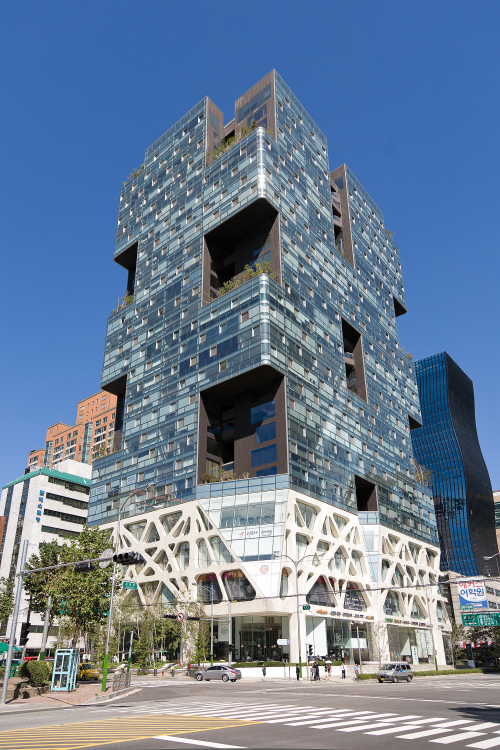 What makes Kring special is the fact that it was designed by a group of the most creative and artistic architects in Korea, UNSANGDONG Architects Cooperation. USANGDONG has tested and realized “conceptual architecture” in order to reveal the potential of architecture as cultural content. It won the world’s prestigious AR Award by Architectural Review in 2007, and the Architectural Record Design Vanguard Award in 2006, an award given each year to the world’s most innovative architect. In addition, the group has tried other artistic activities including the Ssamji Project and the Cheonggyecheon Exhibition of Seoul Metropolitan Museum of Art. 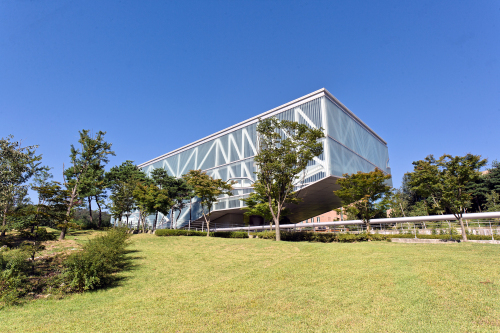 Located at the main gate, Seoul National University Museum of Art serves as a bridge connecting the campus and the local community. The exterior design of MOA also signifies the bridging role of MOA using an exposed steel truss, a design often used in the construction of bridges. The building, taking full advantage of the geographic features of the hill, looks like a huge sculpture floating in the air. MOA, a building with three stories below and three above the ground, covering 4,470 square meters, is divided into exhibition space, education space, data storage space, and recreational space. These spaces are accessed through a spiral-shaped path in the center and two entrances on the sides. Spaces are laid out in an open floor plan, naturally dividing different functions without doors and connecting them at the same time. MOA architect, Rem Koolhaas is one of the most influential and famous architects in modern urban construction design as well as in architectural theory. His design of MOA was evaluated as the CPR for Seoul National University since it presented very different construction logic from existing theories. The winner of the Pritzker Architecture Prize 2000 and the Nobel Prize of Architecture, Rem Koolhaas also designed the Dutch National Dance Theater in the Hague, Kunsthal in Rotterdam, and the Los Angeles County Museum of Art. 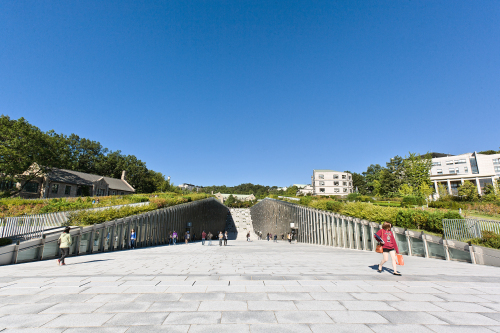 Ewha Campus Complex (ECC) is a new-concept university complex, located underground. A high-tech building, ECC was completed in April 2008. When you pass the main gate of the school, you find the boulevard that starts from the entry point of Ewha Square and ends in front of Pfeiffer Hall. ECC is the country’s largest underground complex: It is 66,000 square meters in area and delves six levels below ground. Despite being underground, it gives the feeling of being above ground because of its unique open valley shape. This allows for natural lighting and ventilation. 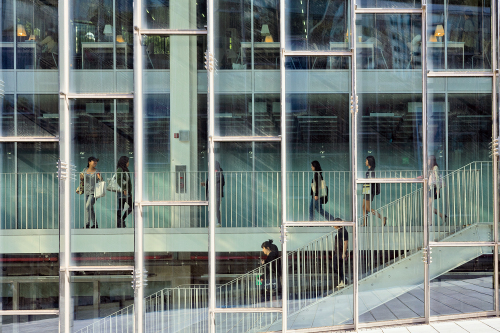 The four upper floors are dedicated to education, culture and welfare facilities including reading rooms, seminar rooms, lecture theaters, global zones, multipurpose halls, a student support department, performance halls, and gyms. The bottom two floors are parking lots with capacity for 750 cars. A garden on top of ECC makes the campus greener, fresher and more comfortable. Using underground water and geothermal energy, ECC bills itself as an environment-friendly structure. The garden absorbs air pollutants and helps reduce noise levels. It also absorbs rainwater and releases it very slowly over a long period of time. This treats the rainwater and reduces energy consumption by controlling the temperature of the roof. This unusual and efficient space was designed by world-renowned architect, Dominique Perrault. The famous Frenchman tries to blend landscape and architecture with sensibility. To take a closer look at ECC, the campus tour program is a good option. The tour is led by Ewha Campus Leaders, students of Ewha Womans University. There are three programs including the regular tour, group tour and free tour. The regular tour is available to anyone who makes a reservation on the website. The group tour is for groups of more than 15 people from middle or high schools, youth groups, and other educational organizations with prior reservations. This is the 98th in a series of articles highlighting tourism spots in Seoul. The guide for planning weekend trips in the capital city will help readers rediscover Seoul. Ed.